Ace Magashule says the nations must allow popular participation by all sectors in the process of transformation. 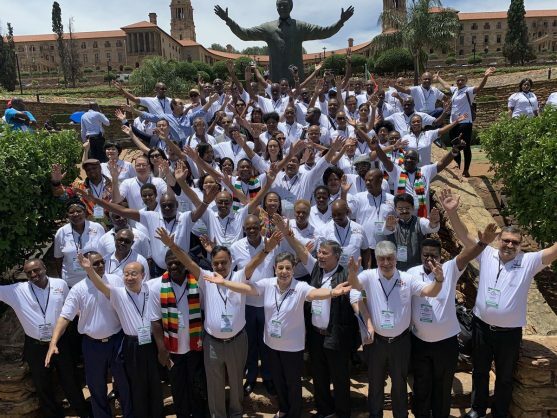 Political parties from the BRICS group of nations, plus other partner countries which met in Pretoria for three days, ended their meeting on Thursday with a commitment to affect closer economic cooperation and foster peace. African National Congress secretary-general Ace Magashule concluded at the summit: “As the Brics community of nations, we choose to cooperate with one another rather than to engage in confrontation. We strive for peace and friendship, to maintain world peace and the settlement of all international disputes by negotiations and not by war. “Our understanding of globalisation is that it is a social process, and not a natural phenomenon. Therefore in this process of globalisation, we are actors and participants in the shaping, or the reshaping, of a social phenomenon. Magashule said the BRICS nations must “rise to the occasion” and allow popular participation by all sectors in the process of transformation. “A new dimension will make BRICS a powerful power block in global socio-economic relations. He said the BRICS nations and their partners have reaffirmed their commitment to a rule-based international system of governance against “attempts to undermine and weaken” it. “We have said that international agreements arrived at must be honoured because the rule of law is paramount for international stability. The reform of institutions of global governance, from the United Nations Security Council to the International Monetary Fund and the World Bank, is long overdue and if achieved will galvanise justice and fairness in the way global governance is managed. The BRICS nations called for an end to protectionism and other measures undertaken by dominant economic powers “because they distort international trade and investment, thus undermining efforts to achieve economic sovereignty for all nations”. Magashule said tariffs and non-tariff barriers that are returning fast in the global economy are a matter of deep concern. “We reject the idea that countries must pursue their self-interests at the cost and to the detriment of our shared prosperity. The nations also called for the deepening of the advancement of women’s rights and their emancipation. ANC member of the National Executive Committee Malusi Gigaba presented the summit’s communiqué which was welcomed and adopted by the delegates. Parties represented at the Pretoria summit included the Workers’ Party of Brazil, the United Russia Party, the Communist Party of Russia, the Indian National Congress, the Bharatiya Janata Party of India, the Chinese Communist Party, South Africa’s African National Congress, and former liberation movements of Southern Africa – ZANU PF of Zimbabwe, MPLA of Angola, FRELIMO of Mozambique, SWAPO of Namibia, and Tanzania’s Chama Cha Mapinduzi.